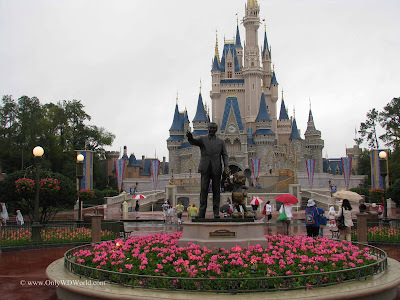 Home � Disney World Vacation , Disney World Vacation Planning , Disney World Vacations , First Time Visiting Disney World Tips � Disney World Vacation: Why A Rainy Day Could Be Your Favorite Day! Disney World Vacation: Why A Rainy Day Could Be Your Favorite Day! A rainy morning at the Walt Disney World Resort could be one of the best things that can happen to your vacation! 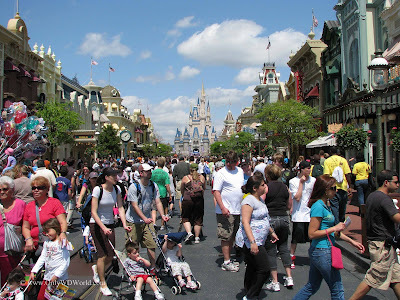 When you are looking to avoid crowds in order to enjoy the wonderful Disney World attractions it is important to be able to go against the trends that the crowds follow. Magic Kingdom Is The Place To Be! 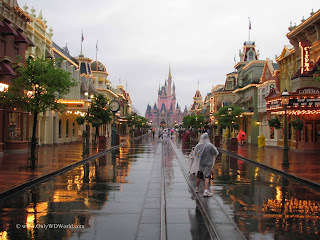 On a rainy day, the Magic Kingdom may be the best place at Disney World to be. 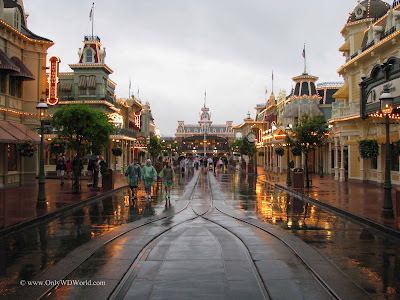 Not only do the crowds try to stay away from the rain, but the Magic Kingdom Theme Park consists of mostly indoor attractions that are located fairly close to each other. Believe it or not the pictures shown here are taken from a Spring Break day during Easter Week where the parks were bursting at the seams, but a morning rain shower at park opening convinced most of the crowds to not venture out until later in the day. By being prepared with an umbrella and willing to deal with the Florida weather we were treated to an almost empty park and extremely short lines for the first two hours of the day. Rain is a part of the Florida weather, so it is in your best interest to be prepared for it. The good news is that the Florida rain showers usually don't last long, so if you have your umbrella and/or rain poncho, you can continue visiting the park while others either head for the exits or hold off visiting the parks altogether. The empty park created an eerie feeling, but this was quickly replaced with joy at all of the attractions that could be enjoyed with the short lines. 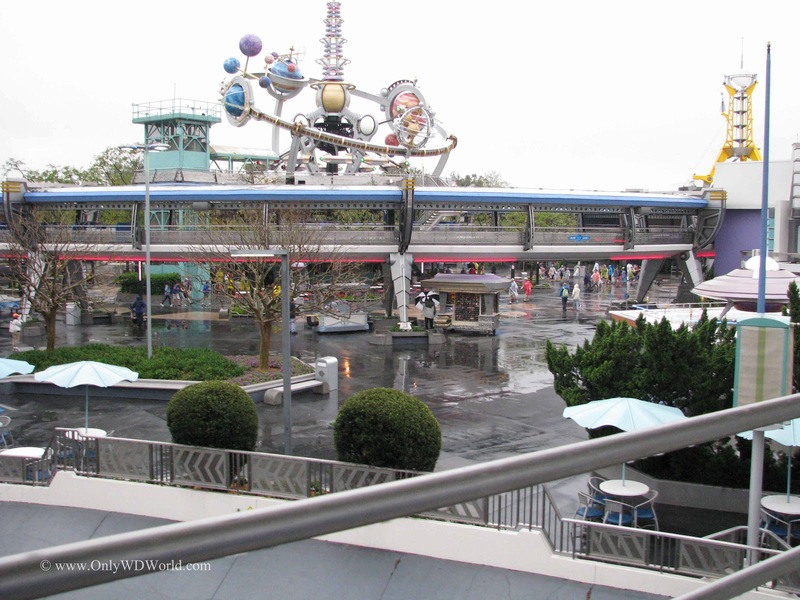 The above view of Tomorrowland meant that Space Mountain had no wait when it had been at 120 minutes or longer all week. 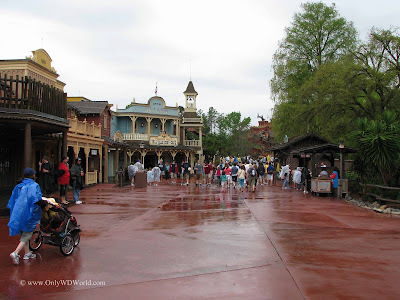 Frontierland looked just as empty. When the sun came out, so did the crowds. Later that same day the crowds returned to normal levels and the lines got very long. Luckily by this time we had ridden all of the most popular rides earlier in the day. It is amazing the difference that a few hours time and a change in the weather can make. 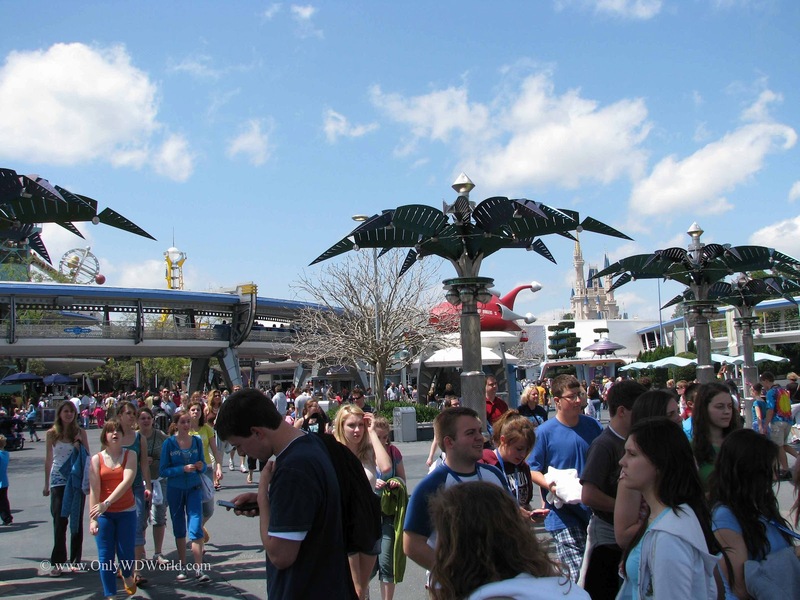 By mid-afternoon the same Magic Kingdom that was so empty at opening was bustling with activity. Bring rain gear! 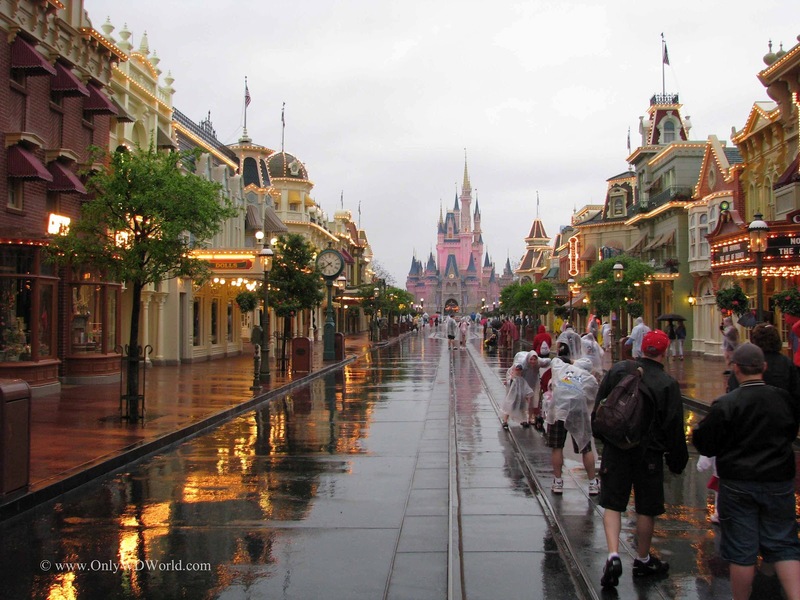 It rains some almost every day during the Spring and Summer at Disney World. Be prepared. This will allow you to continue to enjoy your day, while others are running for cover or figuring out how to dry off. 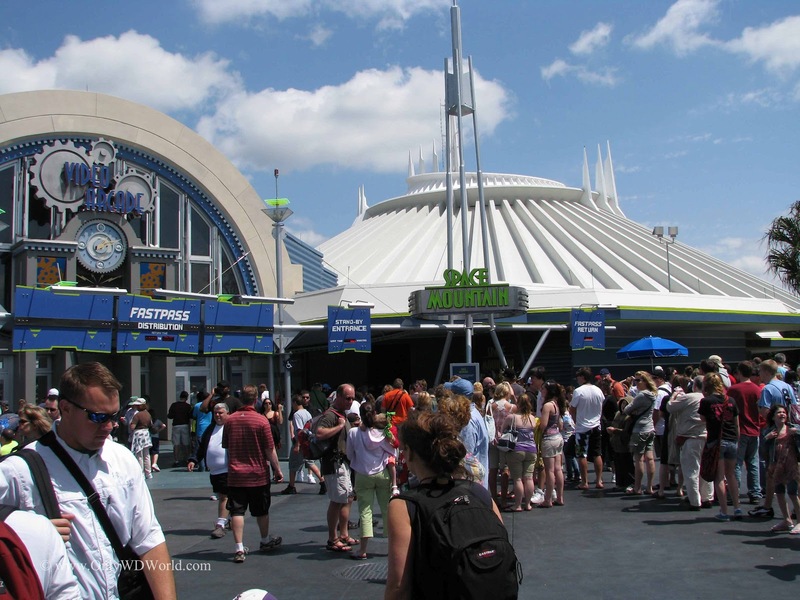 Plan on visiting the theme parks right at opening. The time that the parks open are the least crowded time of the day. Aside from the initial crowd you may see getting through the gate, they will spread out once inside giving you approximately 2 hours of short lines even on good weather days. Don't allow rain to keep you from heading to a park. 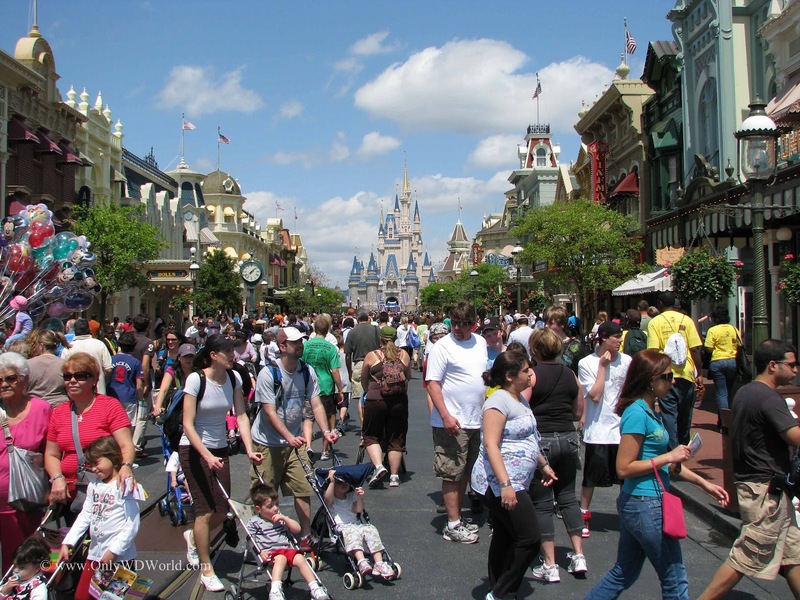 If your schedule is flexible head to the Magic Kingdom since most attractions are indoors and the walking distances are shorter. 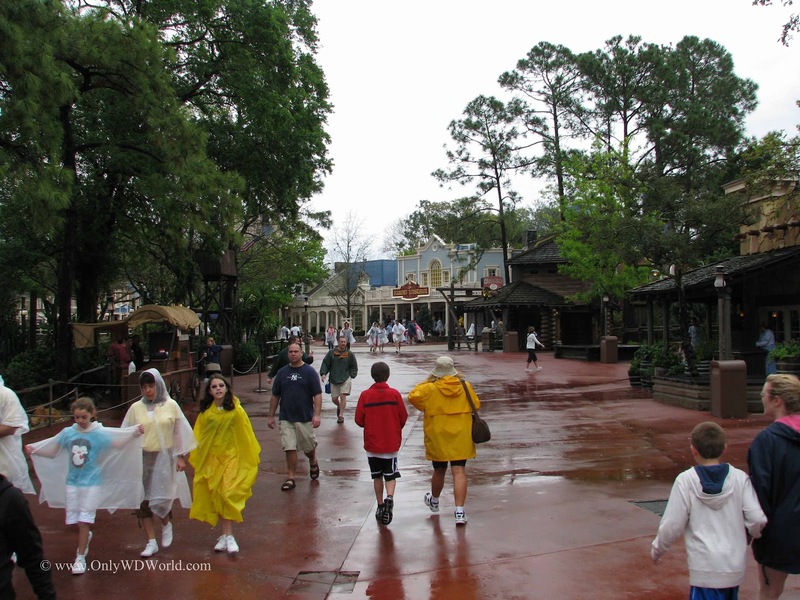 1 comments to "Disney World Vacation: Why A Rainy Day Could Be Your Favorite Day!" This is a great tip! One of my most memorable Disney days was a rainy one. Armed with ponchos and umbrellas, we spent a rainy afternoon in Magic Kingdom. Because lines are typically super long for the Dumbo ride, that was the only ride in Magic Kingdom that I had never ridden. 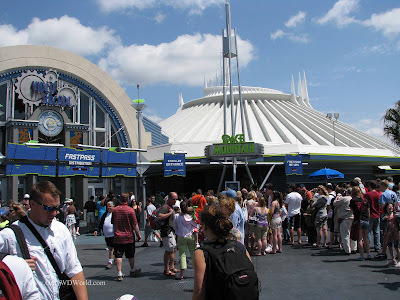 At the age of 21, I was finally able to ride that famous ride - and not only once, but twice! There was literally no wait. It is one of my favorite memories from our many Disney trips.